In hockey, there is one thing that is certain – teams will change. Whether it be players changing teams, organizations or just losing the passion for the game, it is becoming a rare occurrence that a player sticks with an organization throughout their youth hockey career. Because of this, the Arizona Hockey Union recognized the need to highlight their players for their loyalty and trust. Started in 2011, the Mite to Midget Loyalty Club showcases players that have been with the AHU organization from Mites to Midgets, without any changes in travel association throughout their entire youth hockey career. This year, AHU honors two players, Nate Olson and Chloe Tenboer, who are currently teammates on AHU’s 16U Black team under coach Scott Gusso, and will induct them into the Mite to Midget Loyalty Club as the Class of 2018. Nate’s interest in hockey came from his oldest brother, Zach, who is eight years older than Nate, but that did not deter the two from spending hours in the driveway working on stickhandling and passing. Today, when Zach is home visiting, they always return to the driveway and attend as many stick time sessions as they can at AZ Ice. Nate first started playing hockey as a Mite in the initiation program run by Holly Harrington and Kurt Goar, with brother Zach and his dad helping out when they could. To this day, Holly still calls Nate by the name on his first helmet, “Zach,” or whatever name she thinks of at the time. Nate then moved to the Gilbert house league with his dad coaching and Zach helping out. 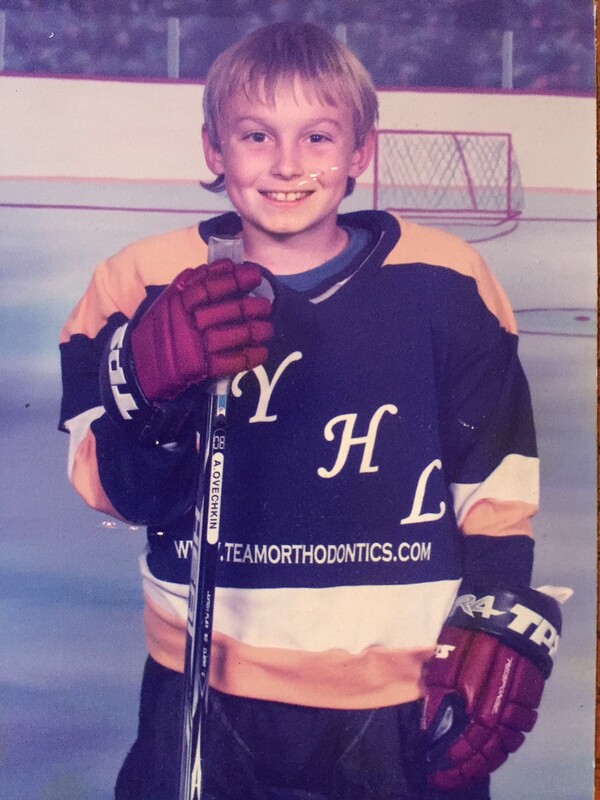 Eventually, Nate moved on to play for Nathan Saydyk and Scott Wallis on the Gilbert Haymakers Pee Wee Select team. Nate still takes pride in the “Mr. Bo Dangles” nickname given to him by Wallis. Nate first played travel hockey when he was a Bantam playing for AHU and Brian May. Chloe first started skating when she was 18 months old with her sister’s figure skating coach, Holly Harrington. When she was five, she was put in hockey skates to correct some bad skating habits. 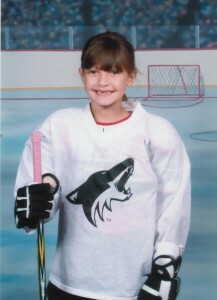 She started playing ice hockey at AZ Ice Gilbert in 2009 with the Kid’s First hockey program and then on to Mini-Mites. Her tenacity was quickly realized and she moved up to Mites. Over the next two years, Chloe really begin to develop, being chosen for the coveted Selects program at both the Mite and Squirt level multiple times. As a second-year Squirt, she was selected to play on the AHU Pee Wee White team under Wade Kelsall. She has continued to play for AHU each season, including Pee Wee White with Bob Platt and Chris Rees, Pee Wee Black with Rees and Wallis, Bantam Black with Rees, Matt Esaena and Wallis, and now as a second-year Bantam under Gusso, Esaena, Nick Beatty and Jim Olson. She has also benefited greatly from private coaching over the years, including Platt, Harrington and Colten St. Clair. Some of Chole’s favorite memories are winning the 2012 Scottsdale Turkey Shoot with the Gilbert Squirt Selects, receiving the team MVP award from AHU Pee Wee White, coaches Platt and Rees, going to Disneyland with her AHU Pee Wee Black team and winning the state championship with AHU Bantam Black. Chloe attended the USA Hockey State Development Camp for the first time last year and was one of only two girls selected from her birth year to advance to the Multi District Camp in Colorado Springs, where she had the opportunity to play hockey with other girls her age from 19 different states. She is excited about the opportunity to be selected to attend the Multi District Camp again this year.